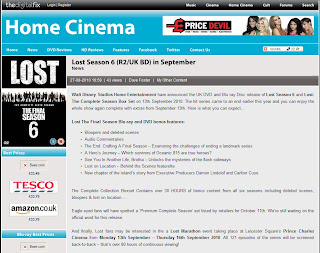 This article from TheDigitalFix.co.uk, and as has been reported by other sites and news outlets, mentions that there will be a LOST marathon of all six seasons starting on the 13th of September. The event will take place in Leicester Square’s Prince Charles Cinema, the screening will be free, but will be limited to the first 280 people who attend. You are encouraged to show up in a LOST costume and bring your own DHARMA food to last the four days it will take ! The site reports that "A Lost goody bag packed full of merchandise will be awarded to each participant"
Pre-registration can be done by emailing lostmarathon@taylorherring.com but this does not guarantee admittance.